John Vorster was the prime minister of South Africa from 1966 to 1978, after having served as Minister of Justice from 1961 to 1966. He was, according to subsequent president FW de Klerk, ‘a thick-set man with heavy jowls and intense blue eyes who was renowned for his deadpan sense of humour and his quick wit’. He was a passionate Afrikaner Nationalist who early in his life became a member of the Nationalist Party as well as of the far right Ossewa Brandwag, an organisation he remained loyal to even when he became prime minister, despite its rejection of parliamentary politics. As Minister of Justice he quashed the increasingly vigorous liberation movements in a period of dramatic opposition to apartheid – the African National Congress (ANC) and its military wing Umkhonto we Sizwe, the Pan Africanist Congress (PAC) and other organisations. He took charge of the State’s repression of all and any opposition to apartheid, instituting security legislation that allowed the police to ban, detain or house arrest anyone he perceived as a threat to the State, including liberals, who he saw as proto-communists. His period as prime minister began with a far-right revolt against the Nationalist Party, which he neutralised. He continued the apartheid policies of arch-ideologist Hendrik Verwoerd, his predecessor, curtailing the rights of Blacks and implementing the homeland policies, influx control, forced removals and the separation of the races in every sphere of life. But he was also more pragmatic than Verwoerd, and sought to establish diplomatic relations with countries on the African continent, embarking on an ultimately failed policy of détente – easing hostilities and establishing diplomatic relations with African countries. He became the most widely travelled of South Africa’s prime ministers. Despite these attempts to establish normal relations with neighbouring countries, he took South Africa to war in Angola, ending the policy of détente and plunging the region into turmoil, and beginning the process of the militarisation of the State which continued when PW Botha succeeded him. After the Soweto uprising, he sought to temper the blunt edge of apartheid by doing away with petty apartheid and making some concessions to urban Blacks, in the sphere of housing and by partially dismantling job reservation, but these were seen as too little too late. His involvement in the information scandal, in which funds were used illegally to bolster the image of South Africa abroad, led to his ultimate downfall. He began schooling at the Spitskop farm school in the Jamestown district, before the family moved to Sterkstroom, where Vorster matriculated. He then studied law at the University of Stellenbosch, completing his studies in 1938. He studied sociology under HF Verwoerd, and was appointed chairperson of the Stellenbosch Junior National Party. He worked at the Cape division of the Supreme Court as a registrar to the judge president, and during WWII defended Afrikaners opposed to South Africa’s involvement in WWII who were charged in terms of the emergency regulations. He was elected chairperson of the Herenigde Nasionale Party (HNP) in Port Elizabeth. Vorster joined the Ossewa Brandwag (OB, translated as Oxwagon Sentinel) and because of the organisation’s rejection of the parliamentary system, he withdrew from the HNP in 1941, having become the HNP candidate for a by-election in King Williamstown. He became chairperson of the Federasie van Afrikaanse Kultuurvereeniginge (FAK) and also chair of Park rugby club. He was involved in a clash with the Eastern Province Rugby Union, which he perceived as biased against those opposed to SA’s participation in WWII. In August 1940 he was appointed chief general of the OB in the Eastern Cape, and served in the OB’s Cape provincial executive. On April 23 1942 he was detained under emergency laws and held for about three months by the Smuts government before being transferred to the internment camp in Koffiefontein after a hunger strike. He was placed under house arrest in Robertson for three months after his release from Koffiefontein. Vorster was released on parole in Robertson under the responsibility of Town Clerk Gert van Rooyen. He was under house arrest at Van Rooyen's place, and needed to get permits for every outing. He went to Cape Town to appeal to the Minister of Justice Colin Steyn on behalf of OB comrades still under lock and key, but Steyn threatened that he should leave Cape Town or he would be arrested. Vorster and his wife settled in Brakpan, where their three children were born. Vorster was allowed to work and found a job at a local firm of attorneys in Brakpan. He was refused a permit to work in Brakpan but he broke the law and began to practise law again. A Benoni magistrate smoothed things over for him and he was declared free again, for the first time since September 1942. By this time, in 1944, it was plain that Germany would lose the war, but some OB people were still active. Most OB activists were busy helping the families of internees, which Vorster also did. With the OB a spent force, Han van Rensburg urged OB members to join the Afrikaner Party, which had been led by Klasie Havenga. There had been too much conflict between OB members and the National Party for the former to return to the NP, now called the Herenigde Nasionale Party. Vorster joined the Afrikaner Party (AP), an offshoot of a split of the HNP in 1940. The Afrikaner Party held a congress in 1947 in Brakpan, and again in the next year, both organised by Vorster and his wife. He was the AP candidate in the 1948 election, but because of his association with the OB and objections by DF Malan, he was forced to stand as an independent. He lost to AE Trollip of the United Party, by two votes. Vorster had probably lost the election because he had laid off electioneering for two weeks after Malan searched for another candidate. Verwoerd wrote a leader in his newspaper, Die Transvaaler, telling NP voters not to vote for Vorster. He later apologised to Vorster for the move. The Afrikaner and Nationalist Parties merged in 1951, and the HNP was renamed the National Party. Vorster wanted to stand for the NP in Brakpan when the next election came round in 1953, but was persuaded by party leader Jan de Klerk (father of FW de Klerk) to stand for neighboring Nigel, which he won. Now an MP, he began to attend parliamentary sessions in Cape Town. He joined the National Party and stood as its candidate in Nigel in the 1953 general election, and won the seat. In the same year he was admitted to the bar in Johannesburg, and practised as an advocate until 1958. Prime Minister JG Strijdom died in 1958, and Verwoerd succeeded him. A change in the constitution allowed for deputy ministers to be appointed for the first time, and Prime Minister Verwoerd appointed Vorster Deputy Minister of Education, Arts and Sciences in 1958. He was also the deputy minister of National Welfare and Pensions, in which position he oversaw the Extension of University Education Act of 1959, which enforced separate universities for the different racial groups. Vorster was appointed as the Minister of Justice by Verwoerd in August 1961. His appointment came in the wake of momentous events in the country: the Sharpeville Massacre had taken place in March the previous year, and the ANC and PAC had been banned soon after. The liberation movements then made the decision to end the policy of non-violent resistance, and embarked on campaigns of sabotage. Vorster’s appointment was greeted with dismay from the English press, which brought up his rejection of parliamentary politics from his days with the OB as a harbinger of things to come. In an attempt to quell misgivings about his commitment to parliamentary politics, he added that he believed in a free and independent judiciary, in co-operation between all legal agencies, and vowed that he would go out of his way to work with the Bar and the Side-Bar. But, crucially, he added that he would eliminate the ‘big cancer’ in SA: ‘whites who agitated amongst blacks’. True to his word, he signed a string of banning orders, using as his basis the Suppression of Communism Act, and banned liberal activist Patrick Duncan and Joseph Nkatlo, the vice chairman of the Liberal Party of the Cape. When in October 1961 Albert Luthuli won the Nobel Peace prize, Vorster refused to allow him to travel to Oslo in Norway to collect his prize. On the day the award was announced, Vorster announced that the government was considering tough measures ‘to limit the freedom of speech and movement of agitators’. But Luthuli was eventually given a ten-day temporary passport to collect his prize in Oslo. On May 12, 1962 he revealed details of the General Laws Amendment Bill, commonly referred to as the Sabotage Bill. He maintained his tough stance despite accusations of Nazism, fascism and totalitarianism from the English press and liberal politicians. The bill equated sabotage with treason, greatly expanding the definition of sabotage to include virtually all forms of protest. It set out penalties for sabotage ranging from five years to the death sentence, and also provided for the State to ban people from attending gatherings, and allowed for the minister of justice to place individuals under house arrests. Vorster later revealed that he had taken inspiration from the Bible, in a passage where Solomon places Shimei under house arrest, and kills him after he breaks the terms of the house arrest. Former Chief Justices A van der Sandt and HA Fagan were shocked at the legislation and expressed their protest, and the Christian Council of SA condemned the harshness of the provisions. The Progressive Party launched a national campaign against the Bill. The issue was debated in Parliament for 37 hours. Sir de Villiers Graaff, Leader of the Opposition, the United Party, attacked the government, saying the Bill would mete ‘civil death’ to people the minister of justice was suspicious of. The Bill was passed by the Senate, and on June 27 1962 it was gazetted. On October 20 1962, the office of the Minister of Agricultural Economics and Marketing was bombed, and MK claimed responsibility. In the same speech, he warned liberal newspapers that they were playing with fire, singling out the Rand Daily Mail in particular. RDM editor Lawrence Gandar replied to Vorster in an editorial, warning him that by equating liberalism with communism he was in effect making a case for communism, projecting it as the principle hope for black South Africans. ‘Communism has never had wide support among the non-whites in South Africa. You are giving it the stature of a mass movement,’ said Gandar. In response to all these developments, the ANC and Umkhonto we Sizwe stepped up their programme of sabotage. On November 21 there was serious rioting in Paarl, later ruled to be the work of the PAC’s military wing, Poqo. Vorster used the incidents to justify his stance. On December 30 1962, in a review of the year that had elapsed, the Sunday Times named Vorster the ‘strong man of the year’, saying he had put 18 people under house arrest, silenced 103, listed 437 people as communists, outlawed the Congress of Democrats, banned the New Age newspaper and prohibited meetings on the steps of the Johannesburg City Hall. The Snyman Commission into the Paarl riots, tabled in the House of Assembly on March 21, 1963, found that the riots had been instigated by Poqo, and that the organisation was committed to overthrowing the government and replacing it with an African socialist democratic state in 1963. The commissioner recommended that the government take action ‘to regain the trust of Blacks’ in the State ‘to protect them’. Vorster endorsed the recommendations, and the General Laws Amendment Bill of 1963 was passed in Parliament on the same day. Vorster asked his old OB comrade, Hendrik van den Bergh, to head the Security Police. He agreed, on condition that he be given the power to remake the unit. He took office on January 14 1963. To make Van de Bergh’s job ‘easier’, on April 23 Vorster unveiled the Ninety-days Act, a remaking of the General Laws Amendment Bill and the toughest legislation yet introduced, which allowed for people to be detained for 90 days without being charged. It also closed loopholes in the earlier bill, allowing the minister to imprison people without trial, even after they had served a jail term – this was designed first of all to deal with the PAC’s Robert Sobukwe, who was soon to be released from Robben Island. The UN Special Committee on Apartheid held an urgent meeting to discuss the implications of the bill, and on April 24 The Times of London described the bill as a ‘cruel and mind-breaking piece of administrative despotism’. The Johannesburg Bar warned that it would abrogate the rule of law in the country. On June 12 Vorster told Parliament that Poqo and the PAC had been decimated, and that the ANC was also being dealt with using the same methods. He said 126 people had been convicted since the passing of the Sabotage Act, all imprisoned for at least eight years; that 511 persons were awaiting trial; 124 Poqo members had been convicted for murder and 77 were in the process of being tried; and action had been taken against 670 people who continued to be members of banned organisations. He said 3,246 Poqo members had been arrested up to June 5. He said these actions were possible because ‘measures were timeously passed by this House… because the police had the necessary powers to take action when they were required to do so’. Vorster and Van den Bergh now turned their attention to the ANC and the Communist Party of SA. They had agents infiltrate these organisations. On July 11 1963 the police raided Arthur Goldreich’s farm in Rivonia and arrested him, his wife, Walter Sisulu, Ahmed Kathrada, LG Bernstein, Govan Mbeki, H Festenstein, Dennis Goldberg and Bob Hepple. The prisoners were put on trial almost four months later – the infamous Rivonia Trial which lasted until the middle of the next year. In April 1964 Vorster received a letter from the secretary of Nobel Peace prize Laureate Albert Schweitzer, conveying a request from Schweitzer, a single line reading: ‘Dear Sir, I beg you, please not to let be hanged those in prison who await judgement of hanging.’ Vorster replied saying that Mandela and his co-accused were facing serious charges, and that they were being tried by an independent court, which would decide whether they were guilty, and what the punishment would be. Nelson Mandela and the other seven trialists were found guilty of sabotage and sentenced to life terms on June 11, 1964. Now Vorster turned his attention to the Communist Party, with Advocate Braam Fischer his prime target. But before they could move on the CPSA, they had to contend with militant liberals. On July 3 1964 police swooped on activists belonging to the African Resistance Movement (ARM), arresting many. But on July 24, ARM member John Harris planted a time-bomb at Johannesburg Station, which exploded, killing one person and wounding a number of other. Speaking at a celebration of the 100th anniversary of the Eastern Cape Division of the Supreme Court, Vorster announced that the 90-day detention clause would probably be suspended by the end of 1964. Braam Fischer was arrested on July 9 1964 but released three days later. He was rearrested on September 23 and charged with furthering the aims of the Communist Party. In January 1965 Fischer skipped bail and went on the run, but he was arrested on November 11 1965. He was found guilty in May 1966 and sentenced to life imprisonment. After Fischer was charged in October 1964 Vorster announced that terrorism and sabotage had come to an end in South Africa. Towards the end of 1965 Vorster had a bill passed, the Criminal Procedure Amendment Act, which would allow the Attorney General to detain people for up to six months. Another bill amended the Suppression of Communism Act to disallow publication of anything said or written promoting the cause of communism. In 1966 National Union of South African Students (Nusas) leader Ian Robertson was served with a banning order, three weeks before Robert Kennedy was due to arrive in SA at the invitation of Nusas. There was a large outcry and Vorster agreed to meet with a Nusas delegation, which came away convinced that Vorster would take further action against the student body. He advised the Nusas leaders to disband the organisation. Vorster had a difficult relation to the student body. Already in August 1963 he had hinted that action might be taken against Nusas. He referred to Nusas as ‘a cancer in the life of South Africa which must be cut out’. Vorster’s success in neutralising the ANC, PAC and other organisations fighting for liberation endeared him to the white population of the country, and many saw him as a future prime minister. Verwoerd was murdered in Parliament on September 6, 1966, and Vorster was approached to become prime minister. Minister of Posts and Telegraph Ben Schoeman was also harbouring intentions to become prime minister, but when it became evident that he would lose the vote against Vorster, he withdrew his candidacy. Vorster was declared prime minister on September 1966. He immediately announced that he would continue to implement apartheid as conceived by Verwoerd. Vorster inherited Verwoerd’s cabinet and left it largely intact until his first reshuffle in February 1968. He also inherited an economy that was enjoying a boom, with the standard of living of Whites rising sharply. South Africa’s growth rate averaged 6% between 1960 and 1970, second only to Japan’s rate. He warned liberation forces that he regarded their actions as acts of war, and that the SAP had been instructed to treat them as war enemies. Vorster had his revenge on the Rand Daily Mail when the State placed its editor Laurence Gandar and senior reporter Benjamin Pogrund on trial for publishing articles about prison conditions. They were given nominal sentences, but the fine of R250,000 was crippling. Under strain, Gandar retired. On Settlers Day, September 4 1967, Vorster gave a speech to a mostly English audience in Grahamstown, calling for unity between English and Afrikaner, a cornerstone of his policy. However, just two weeks before, he was reported as having supported a call for the removal of the Union Jack from the flag. The Transvaal National Party congress was held on the anniversary of Verwoerd’s death, and Vorster proclaimed his motto in the speech he delivered, ‘Fulfil your destiny’. He again talked of Afrikaner-English unity, and also of forging diplomatic relations in Africa. He received a two-minute standing ovation. On 14 September 1967 he was conferred the freedom of the town of Brakpan, where he had practised as a lawyer, and he delivered a speech that drew attention. He announced that the SAP was active in Rhodesia ‘against terrorists’, and also revealed that a Russian spy had been caught. Britain demanded the withdrawal of the police from Rhodesia but Vorster refused – they were finally withdrawn eight years later in 1975. Meanwhile newspapers slammed Vorster for attending the funeral of OB leader Hans van Rensburg, at the same time mentioning the spate of detentions that had begun under his rule. In February 1968 the opposition launched a debate of no-confidence against Vorster. Vorster shuffled his cabinet in late February 1968, removing Albert Hertzog from his portfolio of posts and telegraphs. Hertzog was replaced by Basie van Rensburg, who served until 1970, when he died. Hertzog refused to resign and Vorster had to ask the state president to force him out, in a letter on August 9, which made the dismissal effective from August 12. A Market Research Africa poll whose results were released on January 19 1969 found that 82% thought Vorster was doing a good or excellent job, 11,9% described his performance as average, while the rest thought it poor or very poor. Of Afrikaners polled 92% thought him excellent or very good as a prime minister. The Hendrik Verwoerd Corps of the Junior Rapportryers confronted Vorster on his programme of reform, and they were disbanded by FW de Klerk, When they appealed the decision with their mother body, de Klerk managed to convince the Federation of Junior Rapportryers to reject the appeal and endorse reform. In the 1970 election, brought forward by a year to prevent the HNP from organising its base, the National Party under Vorster won. Meanwhile the Black Consciousness organisation’s South African Students Organisation (SASO) began to mobilise and became active. But first Vorster turned to Nusas. In February 1972 he appointed a commission of enquiry, headed by Alwyn Schlebusch, to investigate various student bodies and other organisations, including Nusas, the University Christian Movement, Beyers Naude’s Christian Institute and the SA Institute of Race Relations. It issued a report on Nusas early in 1973 in which it recommended no action against the body, but named eight leaders it regarded as dangerous. After OR Tiro gave a speech at the University of the North (Turfloop) attacking the policy of apartheid, he was expelled. Student support for Tiro took place at a string of universities, black and white. Protests at campuses were broken up by the police, and many students were fined or forced out of the universities. In June 1972 Vorster fired Vereeniging MP Blaar Coetzee from his cabinet. He was appointed ambassador to Rome. Vorster appointed retired academic Erika Theron to chair a commission into the economic social and political situation of the Coloured people. The emergence of Black Consciousness (BC) and the workers' strikes in Durban in 1973 brought the apartheid system into a new crisis, made worse by the Oil Crisis of 1973, which saw the costs of fuel escalate to unprecedented levels. An Arab oil embargo made the cost of oil much more expensive than it had been. In March 1973 the government banned Steve Biko and a number of BC activists. Eight Nusas office-holders were also banned. In 1974, a coup d’etat in Portugal ended Portuguese colonialism, forcing Vorster to contend with the soon to be independent states of Angola and Mozambique. SA’s cordon sanitaire dissolved, and the country would become vulnerable to attacks from MK attacks from these countries. Recognising that he would have to deal with new neighbours, Vorster declared that ‘black government in Mozambique holds no fears for us whatsoever … I wish them well’. Vorster devised a bill in 1974 to restrict certain organisations. The Affected Organisations Bill, passed early in the year, allowed the State President to declare an organisation ‘affected’ if he thought it a danger to state security, and these were prohibited from receiving foreign funding. Nusas and the Christian Institute were declared affected organisations. For the first time, an Afrikaans novel written by Andre P Brink, Kennis van die Aand, was banned in 1974. Brink was one of a band of Afrikaans authors, called the Sestigers (School of the Sixties), who explored the dilemmas of life under apartheid. On 25 August 1975 Vorster and Zambia’s Kenneth Kaunda together co-chaired talks with Ian Smith and Rhodesia’s black nationalist leaders to work out a deal. There were signs that Joshua Nkomo was open to a deal to end the war. Conservatives accused Vorster of betraying the white man in Africa. Two months later, in October 1975 SA went to war in Angola, effectively ending Vorster’s policy of détente. Using the Riotous Assemblies Act, Vorster’s government banned all outdoor gatherings, with the exception of sports events. The revolt lasted from June 16 to October 1977, just after Steve Biko was killed in September 1977 and when 18 political organisations, most of them belonging to the Black Consciousness Movement, were banned. The international outrage, increased sanctions and arms embargo that followed forced Vorster and his government to concede that the apartheid system was not working. Blacks would be a permanent feature of South African cities, and the first attempts were made to allow blacks to own homes under a 99-year lease system, together with local councils. Recognition of the permanent status of some black township residents had been given in 1977 when Vorster introduced Community Councils to administer township affairs under the aegis of white government officials. In 1977 Vorster appointed Nic Wiehahn to chair a commission of enquiry into industrial relations, who would recommend two years later that black trade unions be allowed to register and take part in collective bargaining and that job reservation be abolished, among other concessions. Vorster also appointed PW Botha to investigate a new constitution to bring Indian and Coloured voters into government, which in the early 1980s would lead to the Tricameral parliament. In January 1978, Vorster appointed FW de Klerk as Minister of Posts and Telecommunications, as well as Minister of Welfare and Pensions, but de Klerk had to wait until April, when the previous minister vacated the portfolio before he could take office. Wimpie de Klerk coined the terms verligtes and verkramptes, and Vorster reacted by dismissing talk of divisions in the party, but divisions were becoming apparent, with Die Burger on the verligte side and Hertzog on the verkrampte side. Vorster was considered a verligte – but only by himself and the verkramptes. The verkramptes, who wanted a minimum of contact between the races, opposed four features of Vorster’s policy: its approach to sports and entertainment, his diplomatic relations with other African states, immigration policies, and English-Afrikaner relations. Early into Vorster’s term Albert Hertzog and his right wing coterie were unhappy with his apparent deviations from Verwoerd’s master plan. They also saw sport as important to keep separate and opposed Vorster’s acknowledgment that sports policies were leading to isolation. In a speech in Heilbron on August 18, Vorster hinted at the faction that wanted to discard attempts at uniting with English South Africans, and labelled them ‘Super-Afrikaners’. By March 21 1969 he confronted the verkramptes, challenging them to come out into the open. Hertzog and Jaap Marais were expelled a few weeks after the 1969 Transvaal congress. Louis Stoffberg was also expelled and Willie Marais resigned before he could be expelled. The HNP launched itself on October 24 1969, readying itself to fight the election due early in 1970, but in the election the party was ‘annihilated’, with les than 4% of the votes. The UP gained some of the NP’s voters. The HNP faction were not the only right-wingers to trouble the Vorster regime. In 1975, FW de Klerk had heard through the grapevine that he would be appointed a deputy minister. Vorster, who was friendly with de Klerk’s father, a former minister of labour, called the old man and apologised because, contrary to an earlier decision, he would not be able to appoint the younger de Klerk at that time. Instead, Vorster instead appointed Andries Treurnicht and Ferdi Hertzenberg as deputy ministers. According to de Klerk, the appointments were made to pacify the right wing of the Nationalist Party, and to keep an eye on the right wing pair ‘rather than leaving them out in the cold and alienating them’. In 1968 Vorster had refused to allow the UK’s Marylebone Cricket Club to tour SA if it included Basil D’Oliveira, a Coloured cricketer born in South Africa. The tour was cancelled and fuelled the international boycott of South African sport. Vorster wanted to counter isolation and sport would be an important arena to oppose isolation. To prevent the isolation of SA from international sports, Vorster tried to move away from Verwoerd’s policy of apartheid in sport, and in 1967 he announced some relaxations of the policy. In April 1971 he introduced a new sports policy, allowing for some mixing under the term ‘multinational sport’ – as opposed to multiracial sport. Now teams from different races could play against each other, but mixed teams were not allowed. He made further changes in September 1976, allowing for ‘mixed sport’ as a response to the Soweto revolt of June 1976. Vorster was perceived as a pragmatist who reversed the earlier Nationalist stance of wanting to ‘stop the world so SA could get off’ – the infamous laager mentality attributed to Afrikaners. Early in his reign he desired a greater leadership role for SA on the continent, but Rhodesia remained ‘a fly in the ointment’. He urged Britain and Rhodesia to reach a settlement. Vorster attempted to become a conciliator on the continent, which later developed into his policy of détente. In January 1967 he met Lesotho’s head of state, Chief Jonathan Leabua to discuss bilateral affairs. Jonathan said it was a milestone on the road to international cooperation. They agreed to remain vigilant against the dangers of international communism. He signed a trade agreement with Malawi in March 1967. On October 23 he met with Ian Smith. Vorster was the most widely travelled prime minister of SA, travelling to Spain Portugal, France, and Switzerland in 1970, Paraguay and Uruguay in 1975 and Israel and West Germany in 1976. He initiated the policy of détente , a warming of relations with African states, but few responded, and those that did were given bribes of sorts. He visited Malawi in May 1971, becoming the first South African head of state to visit an African country. Malawi’s President Hastings Kamuzu Banda then visited SA later that year, one of very few African statesmen to do so. Vorster secretly visited the Ivory Coast in 1974 – a visit organised by Eschel Rhoodie, of the Department of Information – and Liberia in 1975. He created a network to counter the effects of international isolation by forging links with other pariah states such as Israel, Taiwan, the Shah’s Iran and dictatorships in South America. The United Nations took a decision to revoke SA’s mandate over South West Africa (SWA, now Namibia) on October 1966, and after meeting with his cabinet Vorster said he intended to ‘do nothing’ about it, ridiculing the UN. Vorster held talks with UN chief Kurt Waldheim in 1972 over SWA, and established an advisory council on the issue in 1974. In 1975 the Turnhalle Conference convened to draw up a constitution for an independent SWA. The coup d’etat in Portugal, which drew a close to Portuguese colonialism in 1974/5, forced Vorster to review his foreign policy, with independent states Angola and Mozambique now allowing for the possibility of ANC bases in these countries ‘frontline’ states. He met with Zambian President Kenneth Kaunda on a train at the Victoria Falls in August 1975, and met with US Secretary of State Henry Kissinger in 1976, on three occasions. US Vice-President Walter Mondale warned Vorster that the US supported the principle of majority rule with universal suffrage – the ANC formula ‘one-person, one-vote’. In April 1975 the Organisation of African Unity (OAU) rejected his policy of détente, and to prevent Angola and Mozambique from being ruled by left-wing governments, SA went to war in Angola in 1975, spelling the definitive end to détente. Vorster pursued a policy of destabilisation against states in the region. To pre-empt UN-sponsored elections in SWA in 1979, Vorster announced in September 1978 that general elections would be held in the country. Vorster was hawkish in the extreme when it came to ‘state security’ – effectively the security of the white population in the context of attempts to overthrow apartheid. His policies had already been spelt out during his tenure as minister of justice, during which he introduced emergency-like legislation to outlaw resistance to apartheid and led a repressive state apparatuses in quashing of the liberation movements. He established the Bureau of State Security (BOSS), telling parliament that there would be a dramatic increase in security expenditure. 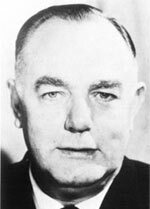 Hendrik van den Bergh, who had been an active member of the fascist Ossewa Brandwag, was appointed to head the bureau. Vorster created the State Security Council in 1972, but the body rarely met – it would become much more active under PW Botha. During Vorster’s reign, thousands had been detained, banned or placed under house arrest. More than this, security police were given a free hand to torture detainees, and when deaths in detention occurred, Vorster turned a blind eye – some suspected him of actively encouraging the practice. Despite these illegalities on the part of the state, Vorster maintained that he upheld the rule of law, and denied that his security staff were guilty of torture and murder. Vorster also introduced compulsory military service for white youth, building the capacity of the army, his defence minister being the even more hawkish PW Botha. Blacks were removed to townships or to the homelands if they lived in areas that became classified as white Group Areas. The population of the homelands increased by 69% between 1970 and 1980. By 1972, 1.8 million Africans had been removed from their homes or ‘endorsed out’ of urban areas. Vorster granted independence to the Transkei in October 1976, Bophuthatswana in 1977. White industrialists, forbidden by Verwoerd to invest in the homelands, were encouraged to invest on an agency basis. So-called ‘border industries’ were created by the state so Blacks could live in the homelands and travel to work in ‘South Africa’. Vorster’s government ensured that each of the homelands was ruled by chiefs or puppets who would do its bidding, so there was no opposition from these ‘black leaders’, with the exception of Chief Mangosuthu Buthelezi, who refused ‘independence’ and resisted the government’s schemes. About 600,000 Coloured and Indian people were resettled in terms of the Group Areas Act. Vorster maintained petty apartheid at the beginning of his reign: segregation on a micro-level, with park benches for separate groups, separate entrances to public buildings, and a host of other means of keeping Blacks out of the spheres of White everyday life. When Eschel Rhoodie began his campaign to polish SA’s image during the Information Scandal, he argued that laws that diminished the dignity of Blacks could be abolished without altering the essential structure of apartheid. Vorster then made some attempts to do away with petty apartheid, allowing Blacks (Africans, Coloureds and Indians) access to facilities some restaurants, hotels, libraries, parks and museums from the mid-1970s. To correct the bad press SA was receiving, especially in the international media, Vorster allowed Eschel Rhoodie of the Department of Information to embark on a major but covert campaign to boost SA's image abroad. Rhoodie was convinced that a conventional approach to influencing public opinion was ineffective, and more drastic and unconventional means had to be used. Rhoodie saw the growth of the anti-apartheid lobby in the Western capitals as particularly threatening, as it effectively pushed for sanctions and divestment. Rhoodie worked with Connie Mulder, the Minister of Information, and the head of the Bureau for State Security, Hendrik van den Bergh. To give some credence to his propaganda, he approached Vorster and Minister of Finance Nico Diederichs early in 1974, and proposed that all laws based purely on colour that diminished the dignity of Blacks that were not essential to the maintenance of apartheid be done away with. To fund the project, large sums of money were transferred abroad in violation of exchange controls. The department also launched an initiative, together with the Dutch Reformed Church, to counter the work of the World Council of Churches, which was doing effective work opposing apartheid and the Nationalist government in Western capitals. When Mulder was asked in Parliament whether government was funding The Citizen, he lied, but the lie was eventually revealed by a commission of inquiry. On 28 September 1978 PW Botha won the race to succeed Vorster, beating Connie Mulder, who had been expected to be the next premier, but was now disgraced by the Information Scandal. When further revelations that Vorster had known about the infogate affairs were reported. The cabinet asked him to resign as state president. Vorster resigned as president in on 9 September 1979 and went into retirement. He settled in Oubos, 150km west of Port Elizabeth. When the right wing of the NP broke away in 1982 he weighed in on the side of AP Treurnicht, the right wing leader of the breakaway. Vorster died in Tygerburg Hospital in Cape Town in 1983 and was buried in Heroes Acre at the Dutch Reformed Church in Kareedouw in the Eastern Cape on 13 September 1983. John Vorster was a hardline defender of apartheid, first as minister of justice, and later as prime minister. As justice minister, he crushed resistance to apartheid and created a legal infrastructure to outlaw all resistance to apartheid. As prime minister he developed crucial institutions that made apartheid a reality. He took Verwoerd’s blueprint and even added to it, developing policies that addressed segregation in every sphere, the homelands, state security, labour, job reservation, influx control, group areas and segregated education, among others. His first moves towards reform were in the sphere of foreign affairs, where he quickly perceived that apartheid would push SA into isolation, which would be costly economically. His policy of detente was a calculated move to lessen these costs, but he eventually took SA to war in Angola, and pursued a policy of destabilization of regional African states. When resistance to apartheid became too widespread to suppress, and the economic benefits of apartheid began to diminish, he began to temper apartheid policies and became a faux reformer. Historian Herman Giliomee, in his book The Afrikaners: Biography of a People, argues that Vorster, unlike the dictatorial Verwoerd, and the dogmatic PW Botha, saw that the Afrikaners were in an untenable situation by the mid-1970s, but failed to make policy and structural changes that could have led to a new dispensation. Vorstre was awarded doctorates from four Afrikaans universities. 13 towns and cities made him an honorary citizen. In 1975 he received the Hendrik Verwoerd Award for Exceptional Service of National Interest. He was the Chancellor of Stellenbosch University for 15 years. The airport at Kimberley and the Johannesburg Police headquarters were named after him but changed after 1994. Vorster was married to Martine Steyn, daughter of PA Malan, co-founder of the NP in the Cape, and also of Sanlam and Nasionale Pers.